I am the heat of your hearth on the cold winter nights, the friendly shade screening you from the summer sun, and my fruits are refreshing draughts quenching your thirst as you journey on. I am the beam that holds your house, the board of your table, the bed on which you lie, and the timber that builds your boat. I am the handle of your hoe, the door of your homestead, the wood of your cradle, and the shell of your coffin. I am the bread of kindness and the flower of beauty. “Ye who pass by, listen to my prayer: Harm me not.” – Prayer of the Woods – used in the Portuguese forest preservations for more than 1,000 years. History and literature have both assigned differing levels of distinction to the trees in our lives. Perhaps it is a way to relate to these primal inanimate life forms. Perhaps we are seeking something about ourselves when we look for meaning in a tree. The nature of their growth is comforting. The oft-used analogies of roots, branches, leaves and fruit are inspiring. But besides for the imaginative light our silent companions spark in us, each tree also has functional, practical properties that further help define their character, their usefulness, their role in the world. When seeking associations for trees we know, many come to mind: The mighty oak, the bright maple, the stately pine, the solid cedar, the regal olive tree, the prolific grapevine, the fruitful palm, the weepy willow. However, amongst the known trees of the world, there is one that is repeatedly underestimated, overlooked, easily discarded and dismissed amongst their more popular brethren. I am speaking of the humble acacia. Though there are over one hundred species of acacia, I am referring to the biblical acacia, most likely what modern botanists, dendrologists and horticulturists would call the acacia raddiana. Acacias live mostly in the dry areas of Africa, where if not the only plant in the endless arid desserts, then certainly the most important, life-giving creation for untold miles. They are particularly abundant in the Sinai dessert. In Israel, on the long drive along the Dead Sea going south from the ancient city of Jericho to the modern resort town of Eilat, the venerable acacia will be the only steady companion for many miles. The acacia is perhaps the most prominent and sought-after sight to desert travelers. Its distinctive, wide, umbrella-like canopy is a welcome relief from the hot sun. The tree itself seems perfectly and uniquely designed for harsh conditions. The leaves of the acacia are very small, helping it conserve water. In times of severe water shortage it can completely shed its leaves in order to protect the body of the tree. Its roots dig deep, very deep, hungrily seeking water as far and wide as it can. It’s a slow grower. The slow growth creates a hard and very dense wood. The heartwood, when polished, possesses an elegant red-brown tint. Perhaps one of the more intriguing properties of this unique tree is that its wood does not decay as the wood of most other trees. During the slow growth of the tree, the root system, besides drawing water up, also attracts other substances from the earth that form part of the wood and function as a preservative. The extremely dense, preserved wood then becomes unattractive to insects and much less likely to suffer decay from water damage or decomposition. If there was ever an eternal wood, a wood that was ideal for the construction of the Tabernacle, a wood that was dense, solid and decay-resistant – the acacia was it. This article about the acacia is the second in a continuing series of essays commissioned by my dear friend, Mr. Egbert Pijfers of Norway, based on the artwork of Mrs. Nira Spitz. 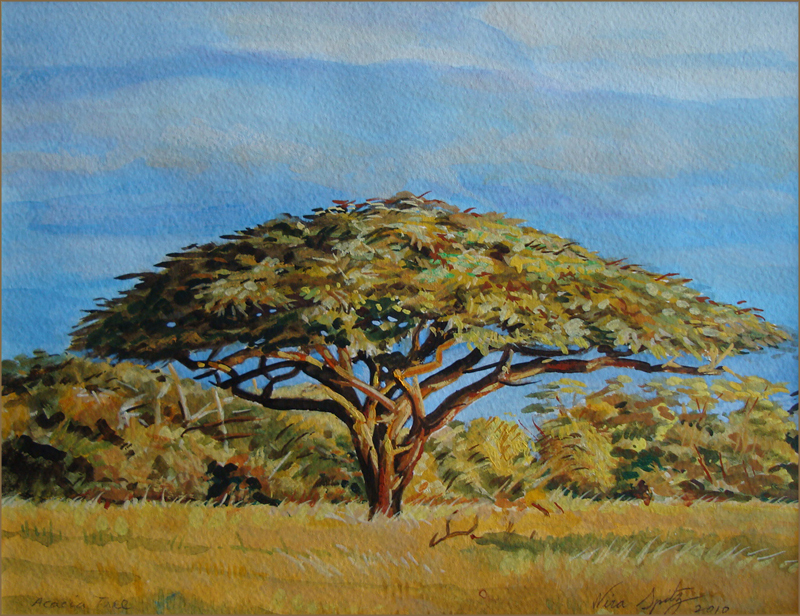 Her painting (above) is of a gracious acacia. The specimen in the painting is somewhat larger than the average acacia. It is situated in what appears to be a savanna, with a guard of thin trees and bushes in the background amidst a floor of sun-yellowed grass, competing for the meager water. One can imagine a lion hiding in the shrubs, ready to pounce on the unsuspecting gazelle laying in false security under the shade of the acacia. Our acacia, serene, unperturbed, stands apart, tall, majestic as the arboreal king of the savanna, as opposed to the desert acacias who rule as the sole citizens of the barren wilderness. But our artist does more than just that. The dance of the shadows plays with our imagination. The early morning sun casts a shade on the western side of the tree, bringing out the deep and subtle greens of the leaves. The maze of tree trunks that characterize the acacia are a visual puzzle. The line between branch, bark and shadow are cunningly wrought teasing the viewer to untangle the wooden toy. The grass on one side tilting west and on the other side tilting east correctly portray the aerodynamic ground forces the wind would exert when running into the broad leaf-tight canopy of the acacia. The greens, yellows, tans and browns of both the tree and foliage behind, realistically portray a moment in the life of the savanna. The light misty clouds are the little that remains of the morning dew, before the unforgiving sun boils the rest into a clear, often-heartless, blue sky. The wind is currently calm and still, the rustling of the acacia leaves is silent. The savanna holds its breath as it is want to from time to time. The gazelle twitches its ear, a sense warning it that danger is near. The lion tenses its muscles, its prey just three paces away. But then the wind shifts. The lion’s scent wafts to the gazelle’s sensitive nose and it knows again in its heart that it must run for its life. However, our concern is not for the hunter or the hunted. Our concern is for the silent witness to the history around it. The acacia. The acacia is first brought to literary prominence in the Bible. 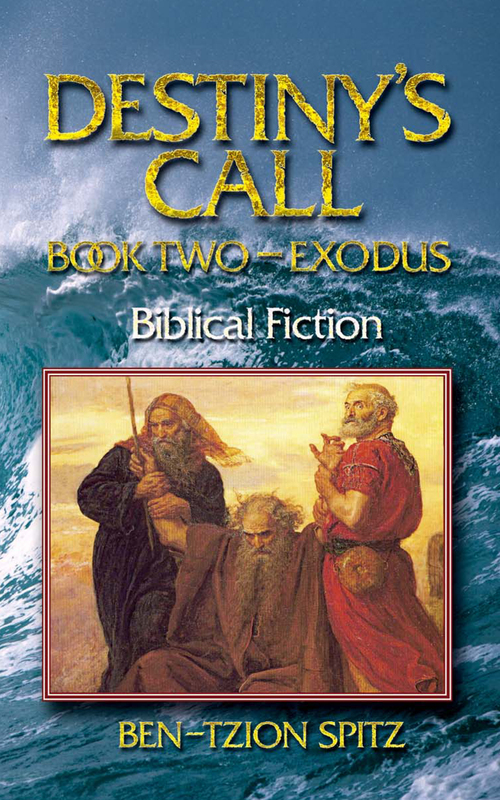 The book of Exodus is filled with accounts of the construction of the sacred Tabernacle; the portable Sanctuary the Jewish people constructed in the desert after they miraculously escaped from Egypt and camped at the foot of Mount Sinai, where God encounters the Israelite nation in the most momentous divine revelation in the history of mankind. Rabbinic commentators explain that the construction of the Tabernacle, which in its innermost chamber housed the Ark of the Covenant with the Tablets of the Ten Commandments, was a vehicle for maintaining and transporting a portable version of the revelation of Sinai with the wandering Jewish people. The main component in the construction of the Tabernacle, its walls, beams, Ark, Table and Altars was the acacia. After the forty-year sojourn of the desert, the Sanctuary and its components found temporary housing over the course of a few hundred years in different locations in Israel, until the reign of King Solomon, when the permanent Temple structure was constructed and then only the original vessels remained, until the destruction of the Temple many hundreds of years later. The whereabouts of the Ark and the other Temple items remains a mystery until this day. But what is the symbolism, if any, of the use of the acacia? Was it merely the only wood at hand? Was there divine providence in the availability of the acacia for such a holy, noble and timeless role? The simplest answer is that the acacia was the only tree at hand. It was the single logical choice. However, the Rabbis were not satisfied with the coincidence of the acacia growing exactly where it needed to be. There is an ancient and curious midrash, a homiletic story, that wonders as to the presence of the acacia in the desert. The answer is fascinating. The midrash claims that the Patriarch Jacob, hundreds of years beforehand, foresaw through prophecy that his descendants, the Children of Israel, would require acacias for the construction of the Tabernacle. Already during Jacob’s descent to Egypt, the Forefather brings acacia trees with him, to be planted in Egypt and then to be taken by the fledgling nation of Israel centuries later during their Exodus and into the desert. Already from the time of Jacob, the acacia is the subject of prophecy with a destiny that leads to an eternal, sacred role in the world. So why does the acacia hold such a distinctive role in Jewish lore? We have studied its physical parameters, but still, there are other majestic trees in the world. 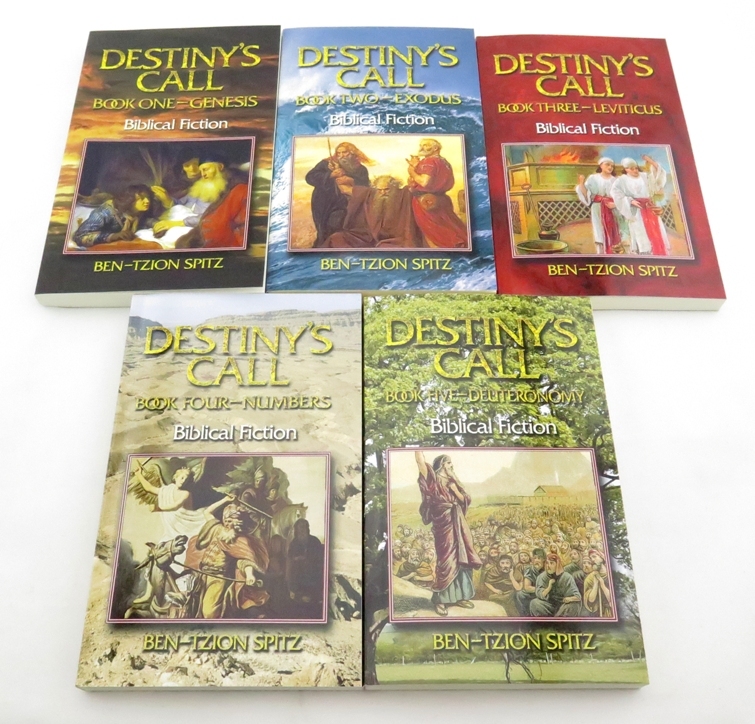 There is a famous midrash about God selecting a mountain upon which to give the Torah. Great, tall, proud, majestic, lush mountains offer themselves and vie for God’s attention. But only simple, lonely, barren, low, humble Mount Sinai receives the historic honor. I recall a similar story regarding the trees of the world, offering their wood to God. The cedars of Lebanon, the cypress, the tamarisk and the terebinth, all boast of their unique properties and merit to be put to the highest divine use. However, like with Mount Sinai, God chooses the humble acacia as the only tree to carry the Tablets of the Law, to form the Ark of the Covenant, to construct the pillars of the Sanctuary that would carry the concentrated presence of God Himself. The acacia proved itself versatile enough to be used for all the different components of the Tabernacle. One need not go far to understand the symbolism of the acacia, for it represents none other than the Jewish people. A people often alone amongst the nations. A people that witnesses and recalls the history of the world around it. A people placed in the harshest conditions, yet surviving. A people with the deepest roots that has withstood the storms of history. A people that draws strength from its ancestors, its legacy serving as nutrients to future generations. A people often dense, but always strong with little sign of decay over the millennia. A people charged with the mission of carrying the presence of God amongst us. A people who reach the heights of divine service, but only as long as it remains humble. We are the acacia. We are the lone tree in the desert. We provide shade and nutrients to those who seek and want. We are versatile. We can be used for a variety of sacred purposes. We are tenacious, hanging on to this world though the hot sun may be beating on our backs and there is no water to be had. We can tap in to deep reserves of sustenance. We remain. We persevere. We affect. We influence. But only if we continue as the acacia – humble.